Whether they face surgery, chemotherapy or radiation, patients are curious about what treatments will work best and what each type means for recovery. So where do we begin when it comes to lung cancer treatment? Any lung cancer treatment plan begins by staging the disease – determining if the cancer has spread, and if so, how far. This helps us decide what treatment is most appropriate. Lung cancer stages are identified using Roman numerals – IV being the highest or most advanced. With stage IV, the cancer has spread to other areas of the body, while stage I indicates the cancer is limited to the lung. As always, the earlier the cancer is found, the better your treatment options and chances for survival. That’s why we encourage anyone who has a history of smoking to talk with a health care provider about annual lung cancer screenings. For those patients who have healthy lungs and are surgical candidates, the standard of care for lung cancer is surgery. With surgery, we remove the lung cancer and a margin of healthy tissue in your lungs. Lymph nodes in your chest may also be removed to check for any sign the cancer may have spread. If there’s a chance that cancer cells were left behind after surgery, we may recommend that you follow up with chemotherapy or radiation therapy. For patients who have comorbidities that may disqualify them from surgery – such as poor lung function or certain heart conditions – stereotactic body radiation therapy, aka SBRT, may be an option. It’s a relatively new treatment that has been shown to have incredible results with lung cancer. 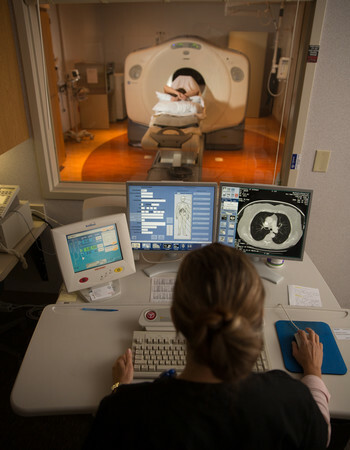 This specialized radiation therapy specifically targets the tumor and basically shuts it down. Most patients who undergo this treatment have little or no adverse effects and have seen their early-stage cancers quickly recede or even disappear. Radiation therapy uses high-powered energy beams that kill cancer cells. Chemotherapy is a combination of drugs in a series of treatments to kill cancer cells. It may be used alone or in combination with radiation therapy. It may also be used prior to surgery to shrink cancers and make them easier to remove. Targeted drug therapy works on cancer cells with certain genetic mutations. This is often reserved for patients with advanced or recurrent cancer. Immunotherapy uses drugs that target your body’s immune system to fight cancer. Palliative care provides comfort and support during and after your cancer treatment to minimize symptoms. As a patient, it’s important to know that any treatments I recommend come with the support of an entire team of experts. At Methodist, we approach lung cancer treatment using a multidisciplinary team approach. At Methodist Jennie Edmundson Hospital and at Methodist Estabrook Cancer Center, we bring together experts in oncology, nutrition, radiation, physical therapy and behavioral health to craft a treatment plan for your needs. The survival rates for lung cancer depend on the stage and type of cancer. There are a number of other factors that can affect survival rates from lung cancer. Age – Lung cancer survival is better at younger ages. Gender – Women tend to have better prognoses than men. Race – African-Americans appear to have lower survival rates than Caucasian or Asian people. Other medical conditions – Those with other serious medical conditions such as heart disease or lung disease do not usually do as well as those who are healthy. Response to treatment – Some people tolerate treatments better than others. Complications – There are many possible complications that can decrease the survival rate. Smoking – Continuing to smoke after being diagnosed with lung cancer reduces the survival rate and can increase the risk of complications from surgery, chemotherapy, radiation and targeted therapies. Again, your best chance for beating lung cancer is to find it early. If you have any questions about your lung health or whether you’re a candidate for lung cancer screening, talk with your health care provider. A physician specializing in pulmonology and critical care at Methodist Physicians Clinic Council Bluffs, Dr. Sumit Mukherjee is devoted to the care and well-being of every person. He strives to be a reliable source of information for patients and their families, answering any questions they may have. His mission is to ensure that patients know they are not alone, and he is right by their side for every difficult moment and every celebration.